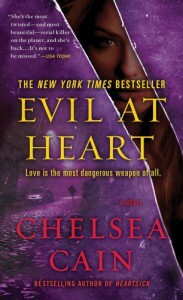 Evil at Heart is the third novel by Chelsea Cain about Gretchen Lowell, a female serial killer. I've read the first two books as well, and just like the others, this one was nice to read. The writing style ant the story are very fast and there is a lot of suspense in the story. The relationship between Gretchen and Archie turns weirder and weirder, but is quite interesting to follow. For me, these are like snack-books I read between bigger/better books, but it is still nice to read every once in a while.